From there you can select any of the Sensei pages, and click Add to Menu to add to your custom menu. Drag and drop the menu items on the right hand side to reorder them, or click on them to edit the menu item text and other attributes. Don’t edit the URL field, or the links will fail to function correctly. Your Course archive page, which lists your courses. Your Lesson archive page, which lists your lessons. The My Courses page, which lists the current user’s courses or a login/register form. The profile page for the currently logged-in learner. 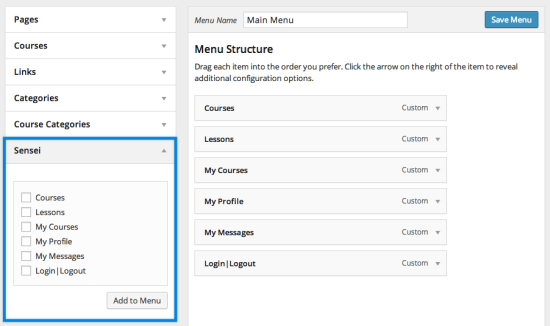 This menu item only displays when logged in, and only if you have public learner profiles enabled in Sensei > Settings. The page that displays a learner’s private messages. This menu item will only display when logged in. If a user is logged in, this link will log them out. If they are not logged in, it directs them to the My Courses page so they can login or register without accessing the WordPress dashboard. The label text is set by default to be Login when a user is not logged in, and Logout when the user is logged in.